The Greatest Role Ever preliminary tournament rolls on, this time featuring Denzel Washington. And what better way to do a Sweet 16 than to bring on Michigan's Finest, host of the Remodeling Clay Podcast Clay Shaver! The show kicks off with a great round of, what else, The Denzel Game, and joining the crew a few minutes in, Friend of the Show, Wit Stillman Fan, Lover of Brie (Allison, Larsen & the cheese), Terrance Malick Apologist, Film Historian and Remover of Eyeworms, The Estimable Twitterless Dr. Earl. Then, onto the tournament, where the greatest Denzel Movie Roles are matched up against each other, as they are whittled down until the best Denzel Cinematic Performance remains. Then, its Playa to Playa, Pimp to Pimp as you'll hear about Denzel in Philadelphia, Denzel in Glory, Denzel in The Hurricane, Denzel in He Got Game... and much, much more. Plus, Remodeling Clay makes more terrible decisions in who he leaves out of the bracket. Mikey and Dave are back in the studio, inviting in Friend of the Show, Wit Stillman Fan, Lover of Brie (Allison, Larsen & the cheese), Terrence Malick Apologist, Film Historian and Nobel Prize of Medicine Nominee for Thuganomics, The Estimable Twitterless Dr. Earl. And back on the Binder & Binder Hotline, good friend of the show and Remodeling Clay Podcast host Remodeling Clay Shaver! First up, a few birthday movies, with mentions of classics like "Sommersby", "Definitely, Maybe" and "Cradle 2 Tha Grave" and then a gross use of the term "chicken finger"
Another round of Word Up! takes place, with thoughts on a new Joker film, the Solo trailer and the Marvel 10th Anniversary picture. 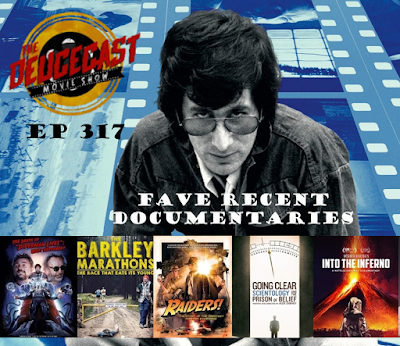 If you look back into The Deucecast Movie Show's archives, you'll find Top Ten Documentaries back in Episode 183 and 184 (July 2015). Since then, a plethora of docs have come out, and the guys take a look at some of their favorites released since then and in recent memory. Shying away from the ones frequently discussed -- "Tickled", "Weiner", "Dear Zachary", etc -- other documentaries surface and resurface, with subjects like Gilbert Gottfried and Nic Cage as Superman and Tower Records and The Beatles and Steven Spielberg and chickens and chicken fingers and racism and volcanoes, Werner Herzog style. Also, the power of nostalgia and Caddyshack. Mikey and Dave kick off the show by not only introducing Friend of the Show, Wit Stillman Fan, Lover of Brie (Allison, Larsen & the cheese), Terrence Malick Apologist, Film Historian and Nobel Prize of Medicine Nominee of Clinical Skin Abrasion, The Estimable Twitterless Dr. Earl, but also on the Binder & Binder Hotline, the guys welcome in Mr Independent Jeremy Burgess. Burgess gives us the first real addition of "The Burgeler" (its Burge-Ler, not Burgel-er, by the way), where like the departed "Valentine's Pink" from year's past, Burgess gives his review of four films assigned to him by the guys in The Deucecast Movie Show. Movies include "Strictly Ballroom" (assigned by Dave)... "Harold & Maude" (assigned by Friend of the Show Remodeling Clay Shaver)... "Broadcast News" (assigned by Dr. Earl)... and "The Fountain" (forced upon Burgess by Mikey). Plus, sprinkled throughout the show are the nominations for the 5th Annual Deucie Awards! Deuce Team back again, check it to wreck it, let's begin! For another movie filled episode of The Deucecast Movie Show, as Dave and Mikey welcome back Friend of the Show, Wit Stillman Fan, Lover of Brie (Allison, Larsen & the cheese), Terrence Malick Apologist, Film Historian, and Nobel Prize of Medicine Nominee for his work in toejam fungus, The Estimable Twitterless Dr. Earl. And the guys also welcome back to the show our own Disney Diva, and co host of the Divas Dish Diz and Amish Paradiser Jennifer Novotny! First up, a round of the IDMb Reverse game -- can you name the movie based on the actors from the list on the IMDb page? Then, a quick Coco review, a round up of Disney vacations and Disney restaurants. Then onto the topic... The best movies 90 minutes or less. Some of the films come in just under the wire, like "Office Space" and "Stand By Me", others clear it by a lot, like "The Rescuers", "The King of Kong" and "Winnie the Pooh".